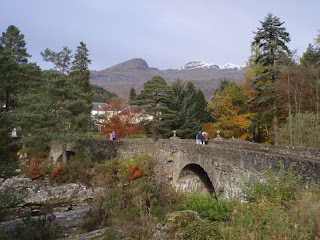 We took a wander up Dumiat recently, Stirling's local hill. The weather was beautiful, early frost warming in the sun, and as I had twisted my foot before Christmas, this was about as big a walk as I could manage. Looking down from Dumiat, I was struck by the view. East, the Forth widens to the sea. West, the flat Carse of Forth, drained in the 18th century by farm improvers, stretches as far as the Highlands. 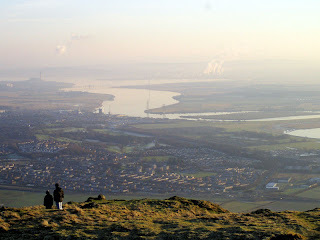 Between the sea and the former swamp lies Stirling, where the Forth squeezes through a gap a couple miles wide between two hill ranges, the Campsies and the Ochils. Stirling Bridge used to be one of the few crossing places on the Forth. Seeing this area from Dumiat brings alive what that really means. This used to be Mannan, a border country between Picts and Britons, before and after the Romans. 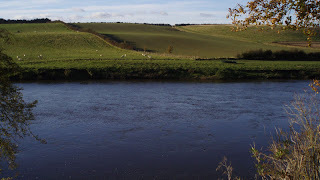 Later, it was the fulcrum between Picts, Scots, Britons and Angles and, after the Scots established a border further south on the Tweed, it became the brooch that held Scotland together. 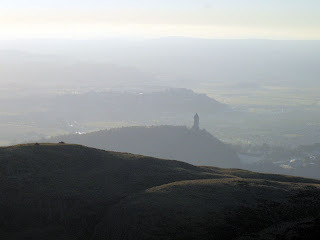 'Whoever held Stirling Castle,' the saying went, 'split Scotland in two.' It is probably the most geographically strategic spot in Britain. The number of battles fought in this area testifies to its strategic importance. Strirling Bridge, Bannockburn, two at Falkirk, Sherrifmuir. Stirling is Britain's Thermopylae. I mentioned this book, Cities, Design & Evolution, briefly in the comments section of my last post. You can probably guess what it is about from the title. I haven't read it yet - it is an academic text book - but from skimming the first and last chapters it looks interesting. The author sets up the premise of the design of items being generally seen as a good thing, and therefore the design of cities is unique in the field of human endeavour, as actually being worse the more designed they are. I am looking forward to reading the author developing this argument - I suspect it resolves around cities being allowed instead to evolve. 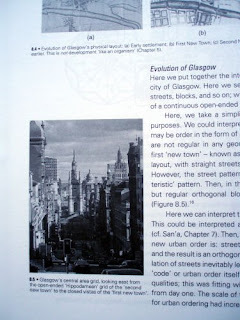 The reason I mentioned it is because it contains some of my pictures of Glasgow. 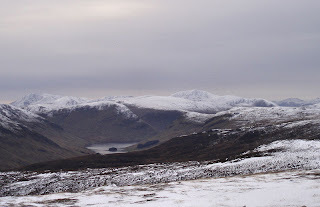 It's about hillwalking, friendship, weather, bagging, and getting away for the weekend. Following the philosophy of The Angry Corrie, it is not about any heroic or mighty acheivements, like Hamish Brown's 'Hamish's Big Walk' or W.H. Murray's pseudo-psychological, mythical mountaineering classics: it's about the more banal, yet more recognisable world of getting some fresh air, exercise and a bit of banter at the weekend. 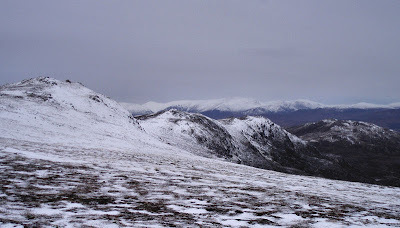 Most of us don't go into the hills for the transcendant experiences described in the purple prose of many outdoor books - most of us do not have awe-inspring tales to recount like Ranulf Fiennes or Reinhold Messner. 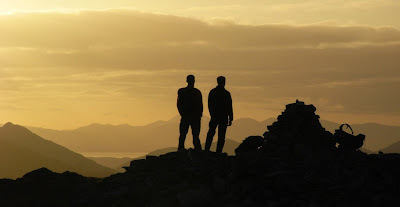 For most of us, hillwalking is just something to do at the weekend. Yet this is still a worthwhile activity, a vaild thing to do with our spare time, and something that - if written about well - can provide as much inspiration as stories of more impressive feats. I hope this book inspires some to get out there, entertains others with knowing nods of recognition, and most importantly of all, sells many thousands of copies. 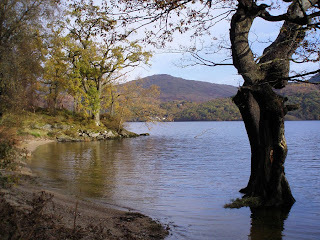 This blog is one year old - I'm glad I started it, as there have been a number of things that have not been appropriate for the main loveofscotland.com website but worth sharing here. There will be an update of the main site soon - there's been a lot of new pictures taken over the last year that I've never got round to preparing, and updates are required to the text for the various areas on the virtual tour. So, here's to the next year! I had never heard of this amazing place before this week, but on a tip off, we went early on a frosty Sunday morning for Bangour Village Hospital. Aha! I recognised it. It is the village I could never quite place when driving along the M8, glimpsed through a gap in the trees. Apparently it was also used in recent Hollywood thriller The Jacket. 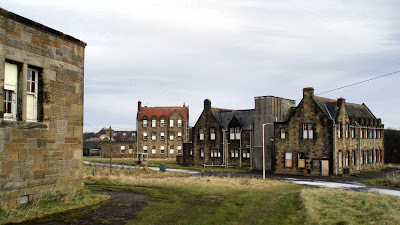 This place is a former asylum, built a hundred years ago, but was not a hospital in the traditional sense - it was a self-contained village, with power house, shop, church, nurse accomodation, activity block, main hospital building, and a number of substantial residential villas, set out in a clearing on a wooded hillside near Bathgate. The village concept, and the level of psychiatric care, were leading edge for its time. We wandered round this deserted and boarded up village, impressed with its size. It is not possible to access any of the buildings, but glimpses in some windows show the interiors to still be in good condition. The site was not abandoned completely until in 1990s and the building of a new hospital for the area. A series of handsome stone villas and flats set in parkland next to Livingston and the M8? It is a prime site for development as a commuter town. Hopefully this site is used again soon, and is not left to decay and 'go on fire' like so many other old buildings in Scotland. 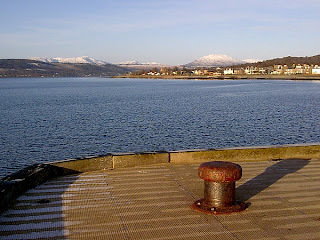 To my hometown of Helensburgh for an appointment this morning. At the station I recognised a tramp who used to hang around the town centre when I was at school. My school friends' band wrote a song about him - Sobriety's Not My Strong Point. He does not seem to have aged in nearly twenty years - an impressive achievement. Whilst waiting for the next train back, I went to the deserted pier. 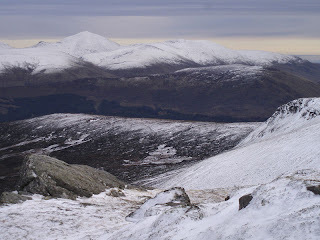 It was a cold and beautiful day - the kind of day to drop everything and head for the snow-clad hills of Argyll. Instead I pulled out my penny whistle and practiced a new tune I've written, Homecoming 2009, my only audience a cormorant in the Clyde. Whilst in a musical mood, I ruminated on a project I've fancied starting for a while - The Mission for Lost Songs. The idea behind this is to create a web archive of good music released by unsigned bands that no longer exist. It is my strong belief - backed up by numerous examples (listen to Opposites, or The Cooling of Lightbulbs pt 2 for example) - that many bands, or artists, have at least one good song in them. Many have a lot more than one song. Yet the vast majority of these bands never recieve much publicity, and fade into utter obscurity after a couple of years. This is a great cultural loss, as these songs are worth preserving. But I'm no Alan Lomax or John Peel, and there is so much stuff out there that The Mission for Lost Song would need to be a collaborative effort. The Mission remains just an idea - for now. Looking back over the year, I've seen a lot of nice places and taken a few good photos. So what's my favourite picture of the year? It has to be one from the top of Beinn Mhic Monaidh, taken in September. The only problem is that I didn't take it - Billy did. green envy of your parking space. I enjoy following the national football team, and try to get to Hampden in Glasgow for each home game. I don't have the time or inclination to follow club football, so the international game - with half a dozen games a year and a party atmosphere - is perfect for a part-time fan like me. Normally, a midweek trip to Hampden in November for a non-competitive friendly game would be a test of loyalty, and the atmosphere at friendlies is always subdued compared to competitive matches. But tomorrow's game will be different. Firstly, it is against Argentina - one of the true giants of world football, and so a once-in-a-generation chance for the likes of me to see one of the best teams in the world in the flesh. "Was it handball?" asked the press after the game. Maradona shrugged, and grinned. "A little with the head of Maradona and a little with the hand of God," he replied. A legend was born in Scotland. I remember at the time that Argentina tops outnumbered Scotland ones on the streets. I felt then it was a little childish. It still is, but that is part of the fun. It will be strange going to Hampden tomorrow, feeling for once as excited to see the opposition as to cheer on Scotland! Alright, I'll admit it. This visit was not in Scotland. 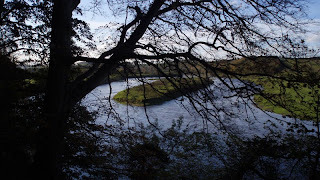 But you could see Scotland across the Rio Tweed! 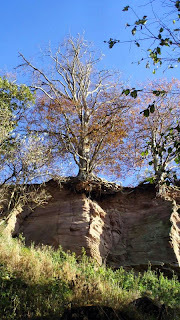 We spent a Sunday of sunshine in and around Norham. The village has an impressive ruined castle, with thick medieval walls, situated above the Tweed on a low sandstone cliff. The castle was built in 1121 at the extreme edge of England by the Bishop of Durham to protect his lands from the Scots, but was captured by the Scots numerous times between 1136 and 1513. It is ruinous now, but enough of it remains to be one of the most impressive castles in Northern England. 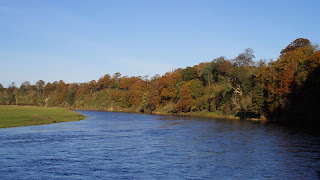 Another impressive castle, Roxburgh Castle, further upriver in Scotland, was not so lucky - it was completely levelled in 1460 by the Scots so that English invaders could not garrison it. 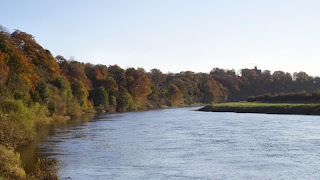 The Tweed at this point is deep, wide and fast-running. Water bubbles up from sub-surface disurbances, and back-eddies form at the bends. Otherwise the river was silent, and there was surprisingly little noise. No traffic, no birdsong. The day was still and even warm in the sunshine - perhaps the last warm day of the year. A leaf-floored path leads downstream from Norham, up and down the soft low cliffs. An occasional swan, heron or family of ducks swam on the water. There was much of interest, and we did not wander far before realising that time was against us. When the sun went behind a cloud, it suddenly became very cold. We wandered through the old village of Norham back to our car and the bridge to Scotland. 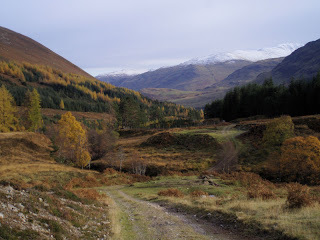 At the start of November I climbed a hill in Glen Lyon. At 11am, on the 11th day of the 11th month, Britain goes quiet for two minutes. In our office, those who were on their feet stopped and bowed their heads. Those sitting at computers stopped typing. No phones rang. The reason? To pay respects to Britain's war dead. This tradition began after the carnage of the First World War - the armistice was signed at 11am on the 11th of November, 1918. The First World War seems very distant now. It is hard to think of the trenches and what they were like. Today, I spent the two minutes thinking of our generation and our children, wondering who will die in action in the name of our country. I hope that there will not be great wars in future, but who knows what the future will bring? We can only hope that our soldiers do not kill and die in vain. Edinburgh's parks, few in number, are well used. Inverleith Park is my nearest and is used at all times of the day and week - it is heartening in our sedentary, solitary age to see Edinburgh at play on its green acres with rugby, cricket, football, ultimate frisbee, and tennis all popular. There's no booking - you just turn up with some friends and play. I have done this before for games of touch rugby, both here and on the Meadows. This evening I walked home through Inverleith Park. A freezing fog was out, rolling slowly through the air like a living thing. The smudged yellow lamplight of the avenues looked like the fog of Old London Town, a stage set for a play about Jack the Ripper. Dark silhouettes moved in the light's margins, British Military Fitness taking their regular recruits through their paces. Across the way under bright spotlights, a rugby team practiced, their clear shouts carrying in the frosted air across the park, the bright white light filtering in rays through tree branches, illuminating the dark glassy surface of the pond, ducks and swans still awake and gliding about. A woman entered the park with her dog - it was wearing a collar with a dim red LED. What was the light on the dog's collar for? Without it, if the dog ran into the middle of the unilluminated area of the park, it would be impossible to see. The avenues through Inverleith Park, the Meadows, and Bruntsfield Links (a free putting course) are well lit and are not no-go areas in the evenings. Back home in Glasgow, I would never have considered crossing, for example, Queens Park at night. Now is the time of year for a few days on the Mediterranean, a last blast of Vitamin D before the dark Scottish winter. We have just returned from a sunshine break. It was our first flight for a couple of years, but the short, instant hit of sunshine and warmth is something that could become addictive at this time of year. It was cold when we left Barcelona - from the beach, snow could be seen on the mountains - but this was nothing compared to the shock at returning home. A cruel wind whipped across the near-deserted streets of Edinburgh, its grey Georgian buildings raw-faced and frost scoured. The flat was a deep freeze. Yet glimpses inside the windows of pubs and bars showed a city going about its business socialising, young clubbers dressed up for a Halloween night out, scurrying to their venues. This weekend I'll head into the Highlands. 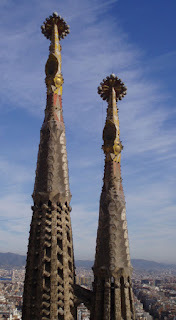 It might be colder still than Edinburgh, and there is nothing in this city to match the Modernisme and easy living of Barcelona. 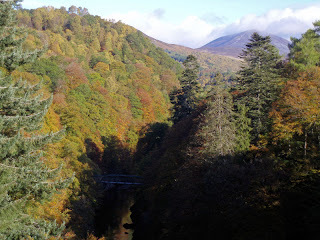 But is there even in Gaudi's joyful, colourful facades, a fire to match the falling leaves of Killiecrankie, sun-caught in beautiful death? Legend has it that St Rule, a Greek monk, had a dream where he learned that the bones of St Andrew were to be removed from Patras - where Andrew was martyred by the Romans - to Constantinople by the Constantine the Great. Being warned by an angel to take the bones instead to 'the ends of the earth', he got in a boat, and ended up in Fife. The church of St Andrews was founded at the spot he landed. It is not known if this legend is wholly correct, or if it is an early medieval fabrication by the Scottish church in their bid to maintain independence from the aggressive English church, whose patron saint was no disciple of Christ, but a mere dragon slayer. In high medieval times, the church would have been a major site of pilgrimage, as people came from far and wide to view the remains of one of the twelve disciples. But the remains aren't there any more - I had not given much thought to it, but assumed that since the Reformation and destruction of St Andrews Cathedral, they had disappeared. Thus imagine my surprise, on reading Doug Johnstone's novel The Ossians recently, to discover that the bones of St Andrew lie in St Mary's Catholic Cathedral, Edinburgh! I popped in for a look last week. More handsomely decorated inside than Protestant churches, this is now the mother church for Fife and the Lothians, yet looks grey and almost apologetic from the outside, tucked away in a corner at the top of Leith Walk. Inside, the shrine lies at the northeastern corner of the church - I walked over and looked. The modest fragments of bone - are they really of St Andrew? - are flanked by gold statuettes, and sealed within a tabernacle. Behind is a small and ancient looking piece of Byzantine art. It is quite astonishing that the remains of Scotland's patron saint lie here, tucked away in a nook in central Edinburgh, completely unknown by the vast majority of Scotland's population. My alarm goes off. What? Where am I? The sound of the occasional car splashing through the rain outside my window. It's cold and dark. It's the middle of the night. Bleary eyed, barely conscious, I stagger over to the window, cold goosepimpling my flesh. Great puddles of standing water tremble in the gutters, autumn leaves bowling along in a massive wind. I shiver. And then I see a man jogging past! He's alert, awake - and now a woman, going in the opposite direction! I think my body might refuse to move if I tried to run at this time in the morning. Who are these people? 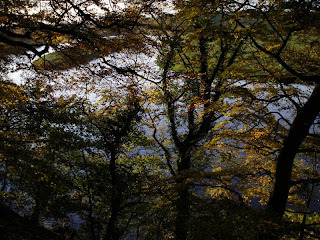 Last Saturday we had a family event, then in the last of the day's light visited North Third Reservoir. 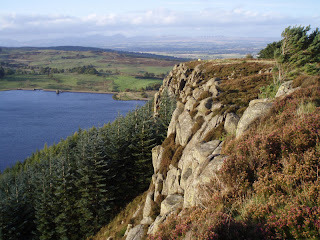 This is dominated by a low but characterful crag that erupts from the surrounding forest. It looks for all the world like a crag in Africa, somewhere exotic, somewhere unScottish. 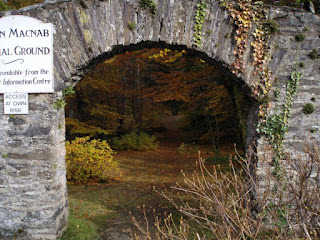 A path leads up the crag through the trees, tiny acorns amongst the yellow-parched leaves. On top, crows dived acrobatically, playing in the stiff wind blowing up the face of the crag, made from large, rounded columns of dolerite. 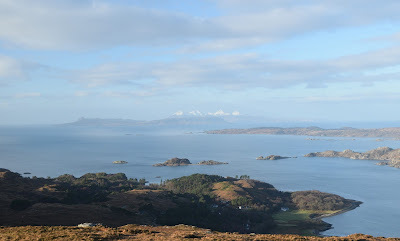 The Highlands were visible north, and the loch with its beautiful wooded islands below. Above and below the crags a forest grows, and at a gap in the cliffs - from where the Wallace Monument was visible, brown-grey stone bathed in sunshine against the autumn colours of the Ochils - we descended towards the reservoir. The moon was out, and locals were walking their dogs. This is stocked with trout and is a popular fishing spot, but the boats were all berthed and the fishermen had gone home. 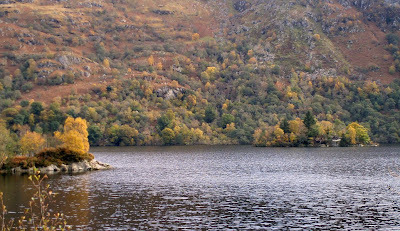 The only fisherman left was the heron, perched in the crown of trees on an island in the reservoir. We shivered in the rapidly cooling evening, a good cobweb-blowing walk before getting back into the car. Due to the family event, I missed the Scotland v Norway football match at Hampden. But after hearing of the result and performance later, it was probably just as well I didn't go! 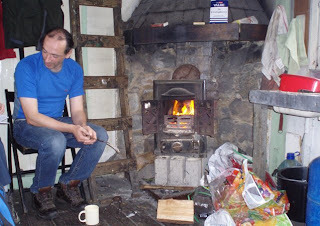 Last weekend, I met with old friends at the Glasgow University Mountaineering Club hut, Clashgour. 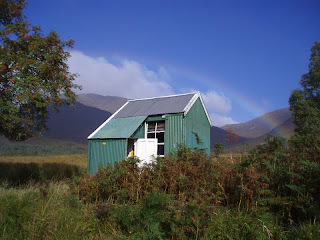 This hut - little bigger than a tool shed - was built a hundred years ago as a school for the children in the glen. It has been leased by the estate since 1948 to GUMC, and provided a welcome haven from grey, wet Glasgow during our student days. The hut sleeps 6 but, according to the GUMC website, sleeps up to 12. From experience, a dozen bodies is exceptionally cosy in Clashgour. 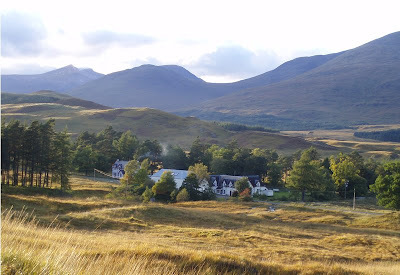 We visited often as students - occasionally to walk the hills, perhaps to do some work on the hut; but more often simply to fester, to get out the city and have a little space for the weekend, walking up the river, brewing tea, and visiting the Inveroran Inn, 45 minutes walk from the hut. This time of year is probably the best time to visit. 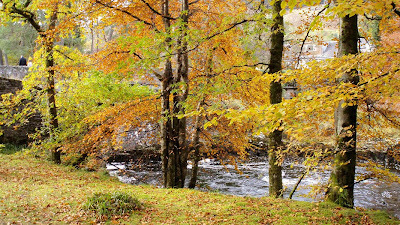 The brown autumn colours; the rivers full; the stags roaring; the stars in a dark sky; the fire stacked. 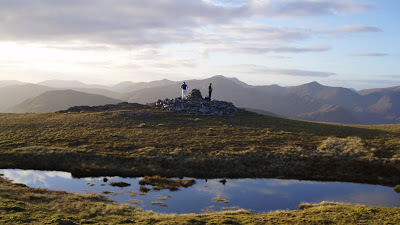 On Sunday we rose late after an evening of juvenile silliness, and headed for the Corbett of Beinn Mhic Monaidh. We were late starting, but as it was my first hill since May, I was determined to give it a go. 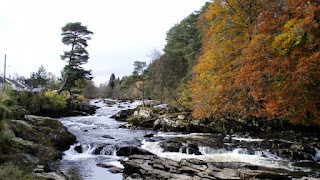 The route begins at a bridge over a beautiful gorge on the River Orchy. We stopped for a few minutes, hoping to see salmon, but saw none - although we did see canoeists leaving the scene! It looks like a dangerous, but exhilarating run. Birds sang in the waterfall-rushing woodland as we ascended an easy track to the treeline, then we slowed considerably tackling the steep southeast flank of the hill. Deer stood silhouetted on the corrie lip, and there were probably many more we couldn't see. We could certainly hear them, roaring like constipated cows. At the top the sun was setting, and the view onto the Blackmount hills is the best I have seen of this range. Ben Lui and Ben More to the east, the ridges and forest of Glenorchy: wood-fringed Loch Awe, shining burnished bronze, Cruachan a dark mass in front of the sun. 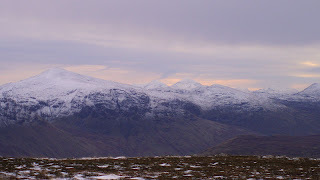 The three Paps of Jura clearly visible (from most angles, only two can be seen), Rannoch Moor, and furthest away, the high, snow-capped peak of Ben Nevis. Billy took a photograph with which to taunt Dave, who was unable to come this weekend. On the way down the road, we stopped in the Real Food Cafe in Tyndrum for dinner. Who should pop in but the current GUMC! They still hold their fresher's meet in Glencoe, and more than half the new intake are foreign. If past years are anything to go by, then most, like butterflies, will not last beyond the first couple of meets and the first snows of winter. I always liked the fact that there really is a place called Blackadder in Berwickshire. Previously, I had assumed it was a name made up by Rowan Atkinson for his comedy series. There is also a Blackadder Aisle in Glasgow Cathedral - and in his first Blackadder series, he plays the Duke of Edinburgh. Is Rowan Atkinson a secret Scotophile? As well as the Blackadder River, there is a Whiteadder River too. I spent a while at a bend in the river last weekend, just watching. It was a mellow, early autumn day, and I was glad to be outside in some rare sun. 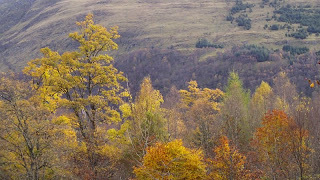 The birch is turning yellow, but plenty green remains to turn. No orange or red leaves yet, treetops waving in a breeze. Ducks in the river, a couple of dippers in the racing waters. My heart always warms to see a dipper bobbing up and down. I could see minnows and small trout in the shallows, and knew that somewhere in the deep pools are much larger fish - maybe even salmon. A flash of blue - a kingfisher! Above, crows attacked raptors. One crow was enough to see off a kestrel, but it took three of them in a wave to see off a buzzard. The buzzard shrugged them off, glided on a bit, and continued hunting a few hundred yards further on. What were the crows protecting? A grasshopper jumped into a nearby pool, and I pulled it out the water, its long, Usain Bolt-like legs stretching and drying. And then with one bound it was away in the grass. A frog jumped away from my feet into the water, and I wondered if it would eat the grasshopper later. Nature does not do mercy. In the evening a bat landed at my feet, squeaking. I left it on a window sill, and it took off again, flying round and round before disappearing into the darkness.